I’m off to America again next month, so I thought it was about time I finished publishing all the places from my trip this time last year! I therefore present Sweetleaf in Williamsburg, Brooklyn, which I popped into in March, so at least the snow in the pictures is still topical! The second of Sweetleaf’s three locations (the other two being in Long Island City, Queens, with the original on Jackson Avenue), the Williamsburg branch opened in 2012, sharing the building with the Modern Spaces estate agents (realtors for American readers). It’s a long, thin space, decked out in reclaimed wood and exposed brick, with a gorgeous, partly-tiled floor, quite a contrast to the modern, open office at the other end of the building. In look and feel, it has more in common with a British pub than with a coffee shop, right down to the table football! It is, by the way, amazing. Like many American coffee shops, Sweetleaf roasts its own coffee, the Williamsburg branch offering the house-blend, decaf and a single-origin on espresso, plus three more, one on the obligatory bulk-brew filter, the second as an iced filter, with the third on pour-over (V60). There’s also a small range of cakes and pastries. Sweetleaf sits on the corner of Kent Avenue and N 6th Street, not far from the Brooklyn end of the Williamsburg Bridge. Perhaps more conveniently, it’s just one block from the East River Ferry (which is at the end of N 6th Street), which connects it to points north (Queens) and south (Brooklyn) as well as the ferry terminal across the river at Pier 11 in Manhattan. It is a gorgeous physical space, with a small frontage onto N 6th Street, but spreading a long way down Kent Avenue (its official address). The main entrance is on the corner of Kent/6th, but you can also make your way in through Modern Spaces with its entrance on Kent Avenue. From the main entrance, there’s a little bit of seating to your left, effectively a pair of armchairs by a window looking out on 6th Street, while the rest of the seating is to your right, running along the Kent Avenue side. This is mirrored by the magnificent counter, which runs along the back wall, before giving way to a small, enclosed kitchen. Things start with a window bar, overlooking the doorway itself, useful if you want to keep tabs on who is coming and going. This is followed by a variety of tables, including one- and two-person round tables, plus a pair of larger communal tables. Beyond these is perhaps the best part of Sweetleaf’s numerous seating options: four luscious armchairs of the sort that, once you sink into them, you really don’t want to leave. Ever. These are in their own cosy area at the far end of Sweetleaf, separated from Modern Spaces by a low, wooden partition. I can see whole afternoons disappearing in these armchairs. 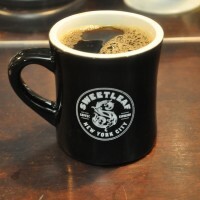 Sweetleaf was something of a pioneer in the American speciality coffee scene, introducing relatively new concepts such as weighing every shot (the baristas still weigh each shot in and out of the espresso machine and a similar level of precision is applied to the individual pour-overs). Like many American coffee shops, Sweetleaf is a coffee-shop/roaster, although at the time of my visit it had only recently bought its first roaster (before then, the coffee was bespoke-roasted for it by another roaster). Also in keeping with many American coffee shops, it only offers cakes and pastries (all baked in-house), a contrast to most UK coffee shops, which find it hard to survive without offering food as well. Although I would have liked to try to the single-origin espresso (an El Jordani Colombian) I’d had a day of espresso and espresso with milk, so I fancied a filter coffee. Since Sweetleaf was good enough to offer hand-poured filter through the V60, I was very tempted. A quick discussion with my barista, Justin, confirmed my decision and I had the V60, an Agua Blanca from Colombia. This had a good body to it and was quite fruity, but was also very smooth, just what I needed at the end of a long day. I paired this with a cinnamon doughnut hole. I wanted something sweet, but nothing too substantial. The doughnut hole was an excellent choice, bite-sized, sweet, full of doughnut goodness, plus, being a hole, it had no calories whatsoever. Obviously. Being cinnamon just made it even more awesome. If you enjoyed this Coffee Spot, check out the rest of New York City’s speciality coffee scene with the Coffee Spot Guide to New York City. You can also see what my friend, Greg, of CoffeeGuru App, made of Sweetleaf when he visited back in 2013. This entry was posted in Cafe/Roaster, Cake, Coffee Shops, Evening Opening, Laptop Friendly, New York City and tagged include by Brian Williams. Bookmark the permalink.